If the old parquet floor has been covered-up for a long time, it will probably need some remedial work to bring it back to its original grandeur. It is likely that you may notice areas where parquet tiles have actually become detached from the subfloor and there may be some blocks missing or have been damaged. The entire floor must be checked before a parquet floor restoration, and if any tiles are no longer firmly attached, or movement is noticed when being walked on, they will require re-seating. The easiest method to use during an initial inspection is to tap each tile with something hard and listen for a hollow sound. 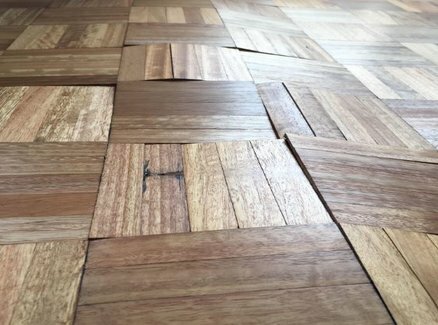 Most parquet floors laid in the UK were originally made with a tongue and groove on at least two edges which helps to lock the tiles together, and great care must be taken when removing any loose or damaged tiles. 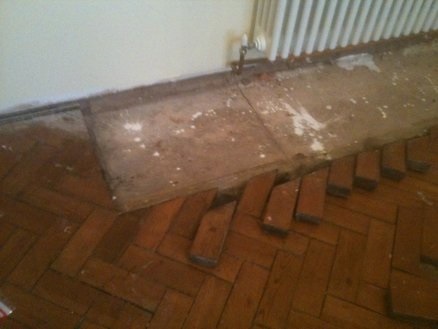 Otherwise the connecting parquet surrounding the loose tiles may also become loose and need re-securing. You may be able to source some tiles to replace any missing ones from another part of the house not planned for restoration such as a cupboard. Old parquet tiles are also available from reclamation yards and on-line auction sites, but you must ensure that replacements are exactly the same size - depth, length, width, wood species and colour before buying. There are many geometric patterns used for laying parquet and searching for the right one can be very difficult, so it is best to familiarise yourself with the different styles beforehand using the page on this site called Parquet Designs before purchasing - at least you will know the correct name of the one you are looking for. 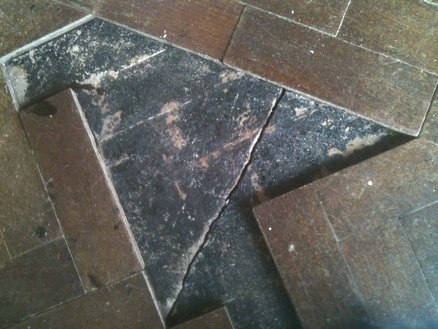 The usual method for laying a parquet floor in years gone by was to position each tile onto a black tar called Bitumen which is commonly used on road surfaces to this day. However, this material is no longer allowed to be used as an adhesive inside the house because of the toxic fumes it can produce. Bitumen residue needs to be removed from all the tongues and grooves on reclaimed blocks before they can be reused, and there is no easy way of doing this. Placing the tiles in a freezer beforehand will make it easier to chisel or scrape off as freezing makes the Bitumen brittle. Dipping them in Paraffin is another way to remove most of the residue, but protection must be worn when using any chemicals of this type. The sub-floor is usually made of concrete, and Bitumen must also be cleaned off this as it can dramatically increase the bonding time of any modern type of adhesive being used. The sub-floor must be made as level as possible when laying Parquet and preparation at this stage is quite important as it will ensure smaller gaps between tiles. It is quite common to find the base uneven after tiles have been removed, as damage to the surface may be caused by bitumen removal. We have found that a Latex Self Levelling compound is the best material for making the concrete an even surface again. A liquid damp proof membrane can then be applied and once dried, will provide a dry barrier to moisture from below. Small gaps between blocks are necessary to allow the wood to slightly expand and contract through seasonal changes in air humidity. This is a natural phenomenon associated with all wooden floors. If reclaimed Parquet tiles have been sourced, they will need to be cut to the correct size before installing into the pattern and sometimes it is necessary to remove the tongue from the edges. When the glue is completely cured, a belt-driven sanding machine and Edge Sander is used for levelling any height differences between the newly laid tiles. Fine dust collected from the sanding machine is used to make a wood-filler by mixing it with a special solution and then applying it to the entire surface with a flat trowel, ensuring the mixture sinks down between each tile gap. A hi-tech spinning sander which has three discs operating in different circular movements creating an extremely smooth surface is then used to remove the dry filler before applying a finish. This produces a better result than the belt and edge sanders for the final round of sanding and will also remove most of the sanding marks made previously.